I pay top dollar for MCD and related rarities. Here's what I still need, although if it is rare/interesting and it's not listed I quite possibly am after it - contact me. Test pressings, acetates, and anything interesting. If it's something that should be on the site but isn't, I am probably after it. If you are interested in selling or trading, email me. 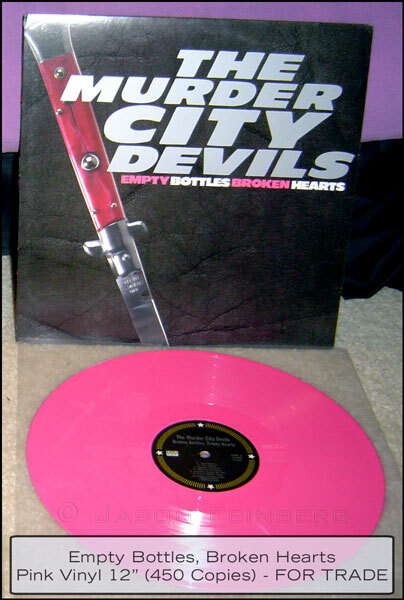 I have many interesting records for trade, such as an Empty Bottles Broken Hearts on Pink, the purple vinyl split w/Botch (200 copies on single sided etched vinyl), In Name And Blood with the Stencil (500 made), and much more. See my trade list here.